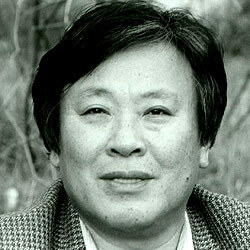 Korea's foremost novelist, Yi Mun-yol was born in 1948 in Youngyang, in the south-eastern part of the peninsula. Though now the author of over thirty best-selling books which include Song of the Front, Our Twisted Hero, The Poet, An Appointment with My Brother and Frontier Between Two Empires, his early life was deeply marked by discrimination after his father defected to the North during the Korean War. "Yi has experienced Cassandra periods, seeing the disasters ahead and being dismissed, even denounced for his warnings." His main themes: the abuse of political power and its affect on the morality and consciousness of the Korean people. The "traitor's son" formally disowned his father in Heroic Age published in 1984. At a stone's throw is the question of exile, best expressed in The Poet which explores the life of Kim Pyong-yon, "Kim the bamboo hat", whose legend shadows its author. The taste is the same." Yi Mun-yol lives in Seoul.